We currently have someone mulling over the questions for what will most likely be our longest interview ever, so we’ve had the idea for this “filler” blog post in the back of our minds for a while. This blog is just under 2 years old, and this is the 208th post. 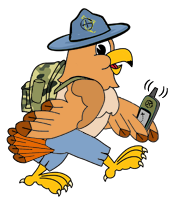 We have interviewed people involved with many Geocaching products and services in that time. We have noticed that some of those products and services never got off the ground, or no longer exist. Fortunately, we’re not aware of any Geocachers who no longer exist. 🙂 Above you see a ROVE, a proposed Bluetooth gadget for instant geocaching and trail sharing. We interviewed Jonathan from Sparkyard, Inc. for this blog on April 18th, 2013. ROVE, best we can tell, was never manufactured, and the ROVE website, and Facebook page no longer exist. Their Twitter account is still up, but hasn’t been posted to since April 15th, 2013, three days before that blog post. We’ve interviewed the creators of many successful crowd funding campaigns over our 208 post history, but unfortunately, our first interview with the creator of a campaign which didn’t meet it’s goal was in October 2014 with Steve Weeks, the man behind the music of the fictional band “The Travel Bugs”. Steve was hoping to raise $16,000 to fund his/their second album “Pimp Your Cache”. With about 8% of the goal met, Steve himself cancelled the Kickstarter campaign with a few days left. He said in an update to the project on the campaign page “Given the current numbers for this project, it’s obviously not going to get funded. I’m going to cancel it (somehow “cancelled” seems better than “unsuccessful”).” Good attitude! He also went on to point out his/their first album is still available on CD or for download from CDBaby.com. This is by no means a “hall of shame”! 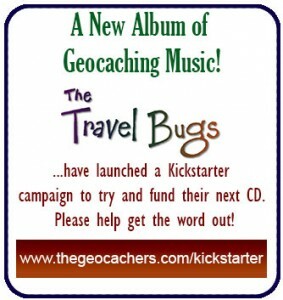 Maybe Jonathan and Sparkyard will find a way to get ROVE or another product to market; maybe Paul will create another great website useful to Geocachers that gets higher traffic; maybe Steve will find a way to get that second album recorded and released. We wish them all luck in their future endeavors.